The Earth&apos;s north magnetic pole has led scientists on something of a chase over the last century. This point, which is not the same as geographic north, is critical for compasses as well as plane, submarine, and ship navigation. Yet over the last few decades, magnetic north has moved erratically over Nunavut, Canada, flitting north toward Siberia. "It&apos;s moving at about 50 km year," Ciaran Beggan, a scientist from the British Geological Survey in Edinburgh, Scotland, told Reuters. "It didn&apos;t move much between 1900 and 1980, but it&apos;s really accelerated in the past 40 years." 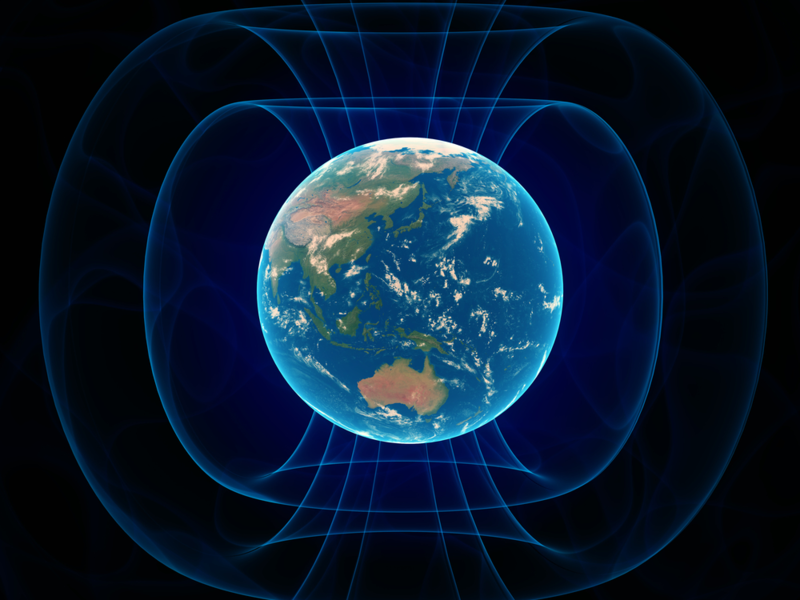 Keeping tabs on magnetic north is imperative for European and American militaries because their navigation systems rely the World Magnetic Model (WMM), which tracks Earth&apos;s magnetic field. Commercial airlines, Google Maps, and smartphone GPS apps also rely on the model to help pilots and users pinpoint their locations on the globe and navigate accordingly. Every five years, the British Geological Survey and the US National Oceanic and Atmospheric Administration (NOAA) release a WMM update to ensure that GPS systems and compasses continue to use the correct points of reference. The next major update was scheduled for 2020, but the north magnetic pole had other plans. In 2018, it crossed the International Date Line and started moving faster. Scientists aren&apos;t sure what&apos;s driving this seemingly accelerated gambol, but the shift was significant enough for the US military to request an unprecedented early review, Beggan said. So the WMM was updated early, on February 4. Earth&apos;s north magnetic pole and the northernmost point of our planet&apos;s axis aren&apos;t in the same place. 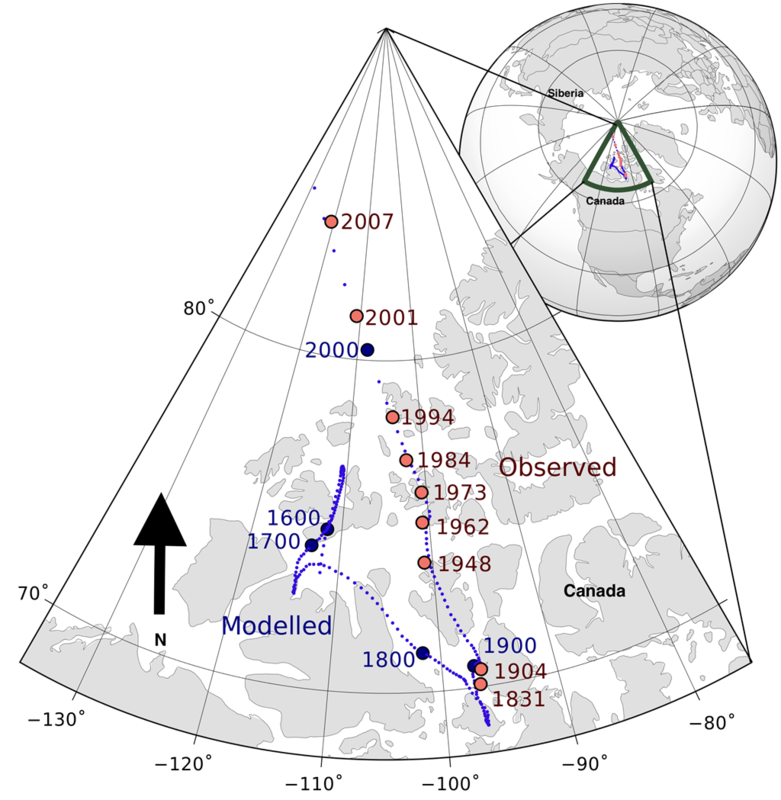 While "true" geographic north is fixed, the north magnetic pole shifts every year. In 1904, magnetic north was in northeastern Canada, but it has been moving toward Siberia since then. The north magnetic pole has shifted northward with startling speed since the 1900s. Earth&apos;s magnetic field exists thanks to swirling liquid nickel and iron in the planet&apos;s liquid outer core some 2,900 kilometres beneath the surface. The field protects the planet from solar radiation and deadly solar winds. Without it, those winds could strip Earth of its oceans and atmosphere. But periodic and sometimes random changes in the distribution of that turbulent liquid metal cause idiosyncrasies in the Earth&apos;s magnetic field. Imagine the magnetic field as a series of rubber bands that thread through the magnetic poles. Changes in the liquid core can tug on different rubber bands in various places. Those jerks influence the north magnetic pole&apos;s migration. Imagine the magnetic field as a series of concentric rubber bands looped close together. Recently, scientists presented two guesses as to why this accelerated migration might be happening. One option is that a powerful geomagnetic pulse, when the magnetic field experiences a sudden and severe jerk, under South America in 2016 may have thrown the field into whack. A second possibility is that a stream of high-speed liquid iron flowing in the inner core under Canada could be linked to the pole&apos;s changes, as Nature News reported. The WMM isn&apos;t a static snapshot of what the Earth&apos;s magnetic field looks like every five years. Rather, it&apos;s a list of numbers that allows devices and navigators to calculate what the magnetic field will look like anywhere on Earth at any time during the five years after the model was published. The problem is that the more the north magnetic pole moves, the more it magnifies errors in the model. So, the WMM has been getting more and more inaccurate since 2016. That means our GPS and military-navigation systems were, too. Those rapidly compounding errors led scientists to initiate the recent emergency update, which was welcome news for navigation models, even though it got delayed two weeks because of the US government shutdown. Fortunately, as Beggan told Reuters, the errors only affected navigation in the Arctic and northern Canada. People using smartphones in New York, Beijing, or London, for example, would not have noticed the north magnetic pole&apos;s recent shifts. But ship captains, airline pilots, and military navigators can breathe easier now that an accurate magnetic north is on the books - at least for the time being. Do bodies sit up during cremation? Are you as a business owner supporting/joining the class action lawsuit against Eskom due to loadshedding ? Yes, loadshedding affected my bottomline . No, just a waist of time .